VOCAL’s speech coder software includes a complete range of speech compression algorithms optimized for execution on ANSI C and leading DSP architectures (TI, ADI, AMD, ARM, MIPS, CEVA, LSI Logic ZSP, etc.). Native software libraries are also available for Android, iOS, and other mobile VoIP applications. VOCAL’s vocoder software modules may be licensed by developers either standalone or as a library. Custom solutions are also available to meet your unique application requirements. Each speech coder may or may not be appropriate for a function and/or platform. Reference MIPS/memory requirements as well as PSQM/PSQM+ values for different voice coders under various network conditions are available from VOCAL for comparison. 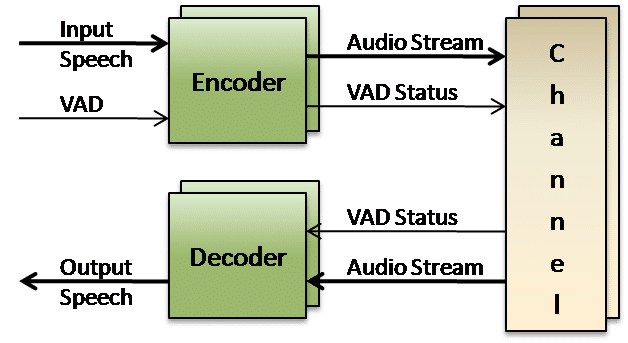 When evaluating a particular voice codec, please contact us to discuss your digital signal processing algorithm requirements.